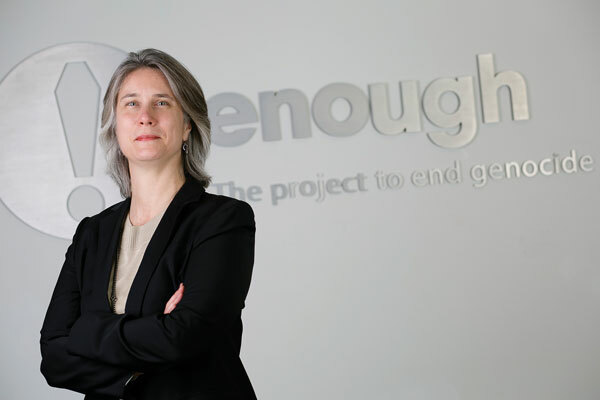 Anna Prow ’88 is managing director and chief operating officer for the Enough Project, based in Washington, D.C.
Anna Prow ’88 developed an affinity for Africa when she worked as a Peace Corps volunteer in Madagascar. It was love at first sight—not a temporary infatuation. Twenty years later, she continues her commitment to Africa—though mostly long-distance—as managing director and chief operating officer of the Enough Project, a Washington, D.C.-based nonprofit organization aimed at ending genocide and crimes against humanity in Central Africa and the Horn. “The Enough Project’s mission played a huge part in my taking the position,” said Prow, who, even before she applied, was familiar with the man who’s now her boss, founding director John Prendergast, a human rights activist and best-selling author who has focused on peace in Africa for more than 30 years. There’s also a practical business administration aspect to what Prow does. She makes sure the organization is compliant with grant terms and their 501(c)(3) status, and that they exercise due diligence in business practices. “Overall, I serve our group so they can look outward. When I joined the Enough Project two years ago, I was fatigued from travel and ready to settle down, but now I’m getting the itch to travel again,” she said. At Longwood, Prow earned an English degree with the goal of being a teacher, influenced by the experience of having parents from other countries. Her mother was from Newfoundland and her father from Germany. Prior to the Enough Project, Prow worked at the National Democratic Institute, Health Care Without Harm and Friends of the Earth in central roles to align policy, practice and programs, and before that advanced academic, cross-cultural and operational goals as academic director of the School for International Training’s Madagascar study abroad program. She began her career as a public high school teacher in Smithfield in 1988. Today, Prow’s work at the Enough Project holds more than enough challenge and fulfillment. “This work makes me so grateful. I’m lucky that I have the strength and opportunity to do it,” she said.